This Christmas was pretty amazing.. we had virtually no money and yet our children ended up waking up to their own hand held video games and a new Xbox 360 Kinect, all of which had multiple games. I, myself, got a WD Live Media Player… it is essentially a little box that sits next to my tv and plays blu-ray quality movies straight off my computer that is in my office. My computer, by the way, currently holds over 70 movies for us (parents) and 50 movies for the kids. So turning on this new media box and being able to flip through over 100 movies is kinda nice. Plus, it also does Youtube and stuff, right on the tv… high quality. I mean, seriously… I’m 34. When I was 5, the newest game to hit the market was the Atari, which featured stick figure characters and a range of about 6 different synthesized sounds. This was the big step up from what I had when I was 4, which was a small coffee table sized unit with a knob on each end. That’s right, it had Pong on it. Also, we were nearing the end of an epic movie media battle between VHS and Beta. Ahh… VHS. You had to press play, then hit fast forward for several minutes to skip all the previews, then press play again to watch the film. Then you had to rewind it when it was done so that you wouldn’t have to rewind it before watching it next time (or returning it to the store and being charged extra). When a movie got to be old (like, a few months), the sound would start to get wonky and if you’re really lucky, the tape would get stuck in the machine and get chewed up. Then they had new players… they called them “Hi-Fi”. We thought the picture was amazing! You know what we did during car rides? We stared out the window. Alright alright… now fast forward to current times, where I have 2 children that have it a little different. The video games today feature life like animations and features, stunning image quality, days of play time, real world environments, open ended style play and most amazingly… a space aged camera that makes your entire body the controller. Not only that, but they can now play games in their hands that are far better quality than what I had when I was a teenager. How did hand held units get so much better than what the top systems had to offer on my television? So much for staring out the window on those long car rides. VHS is all but non existent these days with DVD having replaced them but even that is almost out the door as Blu-Ray is quickly taking it’s place. Watching movies in Blu-Ray is truly an amazing experience all on it’s own but what I failed to mention earlier was how crappy our televisions were. I mean, when your tv has a knob that you must physically get up to walk to and crank to change the channels.. that’s crappy. But today, my boys get to watch 1080P movies on a 46″ plasma television… pretty darn swanky!! 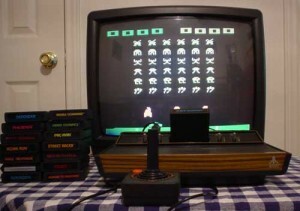 Plus they get to play those controllerless, life like detail games on that plasma tv too. Oh, another nice little perk… is my cell phone. Yes, my phone. When we’re out at a restaurant and the boys are getting restless, I can pop on a game or video or even a full length movie right onto my phone and presto, they’re entertained. I mean, in the palm of their hand they have more than I had in my entire bedroom at their age. So yes, I’ve become a “When I was your age” guy, rather envious of my boys for all that they have compared to what I had but at the same time, rather proud. I mean, we really are your normal family, living paycheck to paycheck, not much to spare on much of anything really, but with a purchase here, a purchase there… over the course of a few years, my boys really don’t have it so bad! By the end of my jealousy induced memory flash backs, I was actually quite proud of what I’ve been able to provide for my family. No, I didn’t invent this new technology for them, but I’ve been able to provide them with it. All in all, that’s really not so bad. And one day, when they’re in their 30’s and thinking about how bad they had it as kids, hopefully they’ll appreciate the fact that despite it being so crappy in comparison, it still was the top of the line, and their parents had it for them. I think I’ll call my mom tonight just to say thanks. You’re only 34? You seem much, much, much older! 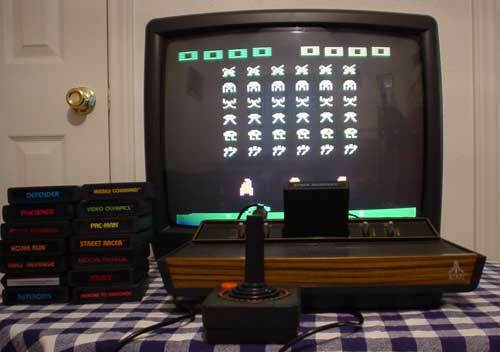 When I was your age, that Atari Console was cutting edge technology. ….. I’m 25, like, 9 years younger than you (omg, you could’ve BABYSAT ME!!!!) and really, not much different. We didn’t have video games though; had some of the dos games on the computer. Man, those were fun. But yeah, VHS, vinyl records (still have ours, by the way, although I think Dad’s been recording and transferring them onto the computer for the vinyl-sound; CDs are apparently too clear) and tapes. I still have tapes and VHS. Oh, and floppies!! like, the BIG ones!!! Had to have about eight of them to install Quest for Glory.